I am kicking off this month’s Genre postings with a great blazer/t-shirt combination from ZcZ. It’s unisex and the t-shirt is optional, as well as turning the color of the collar from gray to black. I adore the t-shirt graphic … “Vintage SL.” This month I’m celebrating my seventh year of blogging in SL! I think that qualifies me as vintage SL. Fashion-wise, I’ve seen a lot of comings and goings, but yet, I still can’t delete my Last Call and Celestial Studio folders from my groaning and creaking inventory. (Imagine eight years of shopping!) I also remember back in the day when events were far and few between and it was a HUGE deal when one came to the grid. Us oldies used to wait for a certain day of the week, (I think it was Tuesday or Thursday) and Last Call would put out a new release. Fifty Linden Friday was just about the only weekly event. I can recall when blonde hair textures were, in a word, disappointing. It was one of the reasons I lived part of my early digital life as a brunette. I also have memories of when the giant enterprise of Truth Hair was a tiny store! I suppose I can wax nostalgic for paragraphs about early SL days, but let’s get back to the real reason for this post, and that’s the monthly event known as Genre. This month, we’re rocking the androgynous look. This is a bit of a challenge for me because I gravitate to a more feminine look. However, the goodies from Genre help me effortlessly make the transition to androgyny. The half-headed hair from the Stringer Mausoleum pairs up nicely with a unisex look and is available in some great colors. The incredibly skinny jeans from Anachron are crazy-skinny, and they’re also available unisex. Finally, Pink Fuel, who makes lovely skins to begin with, put out their ANDRO line of skins just for the event. The skins are available with different lid and brow options, as well being available in male, female and boi. One thing that Pink Fuel does brilliantly is providing every applier and option known to man with their skins. We broke guys and girls really appreciate that. All I can say is soooo many options! Pingback: Genre- Androgynous (Post-110816) - [O.L.D.] 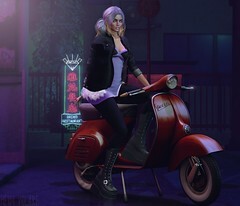 Old London Docks - Best Second Life Fashion & Lifestyle Blog Feeds!